The large snake spotted Wednesday by Westbrook police officers on the bank of the Presumpscot River is likely a Burmese python or a Boa constrictor according to a state reptile and amphibian expert. The snake was first reported Thursday near a playground in Riverbank Park, police said, resulting in a fruitless search. But the reptile popped up again early Wednesday morning when two officers spotted it eating a furry mammal, possibly a beaver. Police estimate it to be 10 feet long. Based on this description, Derek Yorks, a wildlife biologist who studies snakes and turtles for the Department of Inland Fisheries and Wildlife, said authorities are likely looking for a large tropical python or constrictor. He was unable to say with certainty which species — but he was certain of one thing: The snake is alien to Maine. “We don’t have anything big enough to eat beavers, that’s for sure,” Yorks told BDN Portland. York’s best bet was that it is a Burmese python, which is a popular pet throughout the country, but illegal to own without a license in Maine. 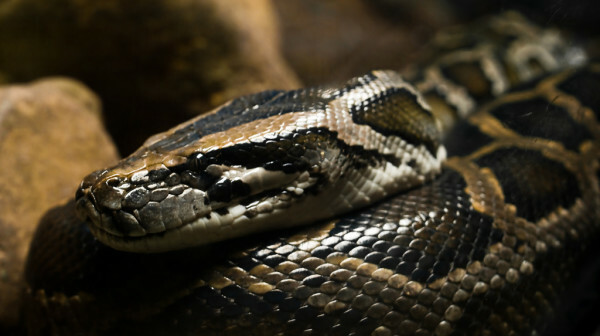 One of the five largest species of snakes in the world, the Burmese python is remarkable even among this group for its rapid growth rate — a characteristic that York said can often prove problematic for unwitting pet owners. Finding the snake will likely prove challenging if it is indeed a python, Yorks said. “They’re really hard to locate and really well camouflaged,” said Yorks. However, he also said that the loose snake is little cause for alarm. “It’s unlikely that it poses any real danger to people,” said Yorks, adding that a tropical snake would not survive Maine’s winter. The state requires a license to own such snakes as pets, although the Department of Inland Fisheries and Wildlife was unable to immediately say whether any such permits had been issued to someone in the Westbrook area. But the snakes are legal to purchase without a license in much of the country, including New Hampshire, that people will frequently bring them into Maine unaware of state law and federal regulations prohibiting their transport over state borders, Yorks said.